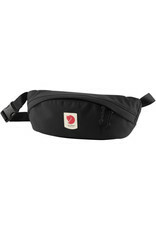 Convenient hip bag in durable Bergshell fabric for traveling and short treks. For when you want to carry as little as possible, Ulvö Hip Pack offers compact storage for your gear. Fjällräven’s durable Bergshell fabric with 31% recycled nylon keeps unexpected showers away from your gear and the reflective logo makes you more visible. The main compartment is complemented by an outside security pocket against your body. Perfect for shorter treks and traveling.